MooseStash Quilting: I felt the "LOVE"
Isn't that sweet? How nice of them to notice your great quilt! It's a well deserved compliment - you work is astounding. Now a Moose in a boat - that sounds so you! Well deserved. 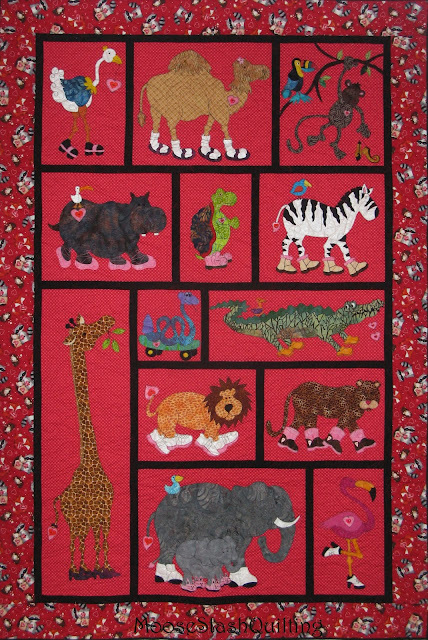 It's a wonderful quilt! You always find the cutest projects and pick the most awesome fabrics. Glad Trisha and Mary spotted your quilt. High praise indeed!!! Red is rarely used as a background color and that really makes your quilt stand out in a crowd!! You go, girl!!!!! It's always nice to know, that the fruits of your labor of love do not go unappreciated, isn't it? We all love receiving a compliment when it is so well deserved. I think that is wonderful. How special that they ;loved it, too. And I did think the moose in the boat would suit you perfectly when I first saw it. Congratulations! Your version tops them all! The moose and friends in the canoe is perfect for moose stash quilting! Will be looking for your version!